Appearances - Helen Caldicott, M.D. 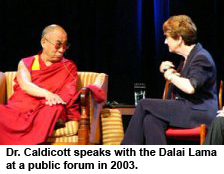 Dr. Caldicott regularly makes public appearances in a variety of contexts, most of which are open to the general public. Dr. Caldicott’s public lectures address the dangers of the nuclear age. She outlines why the nuclear age is the single greatest threat to the world’s public health, namely the profound medical, environmental, political and moral consequences of perpetuating nuclear weapons, power and waste. To enquire about booking Dr. Caldicott as a speaker, click here.